Shaina Silva is an ecosystem architect and venture builder who has a proven track record in creating pathways for economic opportunity in emerging markets. Her regions of focus expand across the Caribbean and West Africa, specializing in building capacity within entrepreneurial communities . In her seven years of forging partnerships with the public and private sector in these markets, Shaina has impacted over 1500 micro enterprises aiming to solve some of the biggest challenges in energy, transport, healthcare, food, education and finance. Shaina is currently a Director of Industry Accelerators for RocketSpace, galvanizing top startups from around the world to build a continuous pipeline of innovation for corporate clients. Prior to joining RocketSpace, she served as the Portfolio Director of a social impact incubator based in Lagos, Nigeria where she headed the management of an investment fund in partnership with the Lagos State Government, and designed entrepreneurship training and incubator programs for the Lagos Ministry of education. During that time, she launched the Africa Startup Academy (ASA), a leadership and entrepreneurship institution that focuses on closing the digital skills gap and preparing young African companies for global investments. She also founded The Workspace Collective (WOCO), a platform that facilitates asset sharing between small businesses and large corporations. Shaina is an alumnus of Babson College in Massachusetts, and Draper University and Singularity University, two prominent institutions for entrepreneurship and technology in Silicon Valley. She is on the Steering Committee for the Haiti Tech Summit, and is the Africa Regional Director for the Global Startup Ecosystem. 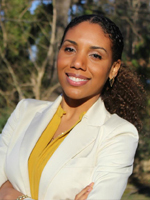 In recognition of her work, service and accomplishments, she’s been awarded the Institute of Caribbean Studies’ “30 under 30, Emerging Leaders Award”, Babson College’s ‘Nan-Langowitz Women Who Make a Difference Award’, and is a proud recipient of ‘The Shelby Cullom Davis Entrepreneurship Prize’.